This KonoSuba Megumin Costume Came Together in 2 Weeks « Adafruit Industries – Makers, hackers, artists, designers and engineers! It’s never too late to try cosplay. You can pick up the hobby at any point. Redditor Anna_Banananana decided to give it a try, and she put her first ever costume together in two weeks. 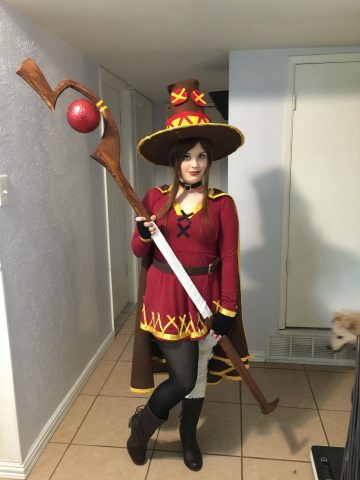 She dressed as Megumin from Kono Subarashii Sekai ni Shukufuku wo!, a.k.a. KonoSuba. Though she’d only sewn fabric by hand before, she wasn’t intimidated. To make this costume, she learned how to sew using a machine. She explains Redditor IcyPyromancer made the staff (the ball appears to be floating thanks to fishing line), but that she crafted the rest and poured a lot of time into the effort.